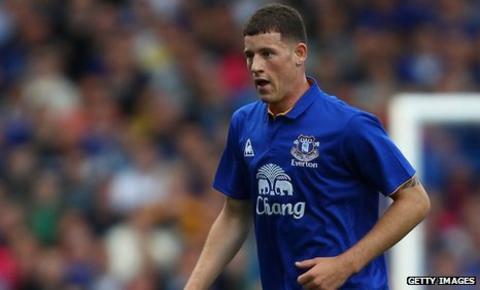 Highly rated teenage midfielder Ross Barkley has signed a new four-and-a-half-year contract with Everton. Manchester United, Manchester City and Chelsea were reported to be tracking Barkley's progress. But the 18-year-old has agreed a deal keeping him at Goodison Park until the end of the 2015-16 season. Chairman Bill Kenwright said: "We are pleased but not at all surprised that Ross has agreed his first long-term contract with the club." Barkley agreed his first professional contract shortly after his 17th birthday but could only sign a long-term deal once he turned 18 earlier this month. He progressed through the Everton academy to make his senior debut in the opening Premier League game of the season against Queens Park Rangers. Much is expected of the England Under-21 international, who has been described by BBC pundit and former Everton defender Martin Keown as "one of the best players we'll ever see in this country". News of Barkley's contract comes a day after Everton re-signed Los Angeles Galaxy striker Landon Donovan on a short-term loan.